Just after robbing a plant store of a rare Amazonian hybrid, Poison Ivy encounters a strange man in a hazmat suit in the street. Government agents quickly appear to carry him away. The strange man is mumbling, and Ivy hears the word “Acachiano,” an area of the Amazon known for its rare plants. Ivy decides to stop the agents and save the kid. Moments later, and to Ivy’s surprise, all the agents lie prone, surrounding the kid. Ivy and her new ward run off. Later, Batman and Commissioner Gordon meet in the Commissioner’s office. They conclude that the 17-year-old boy exudes toxins from his skin, and he was kidnapped by U.S. government agents. Now Poison Ivy has him under her sway, and Gordon can’t act due to federal jurisdiction. Soon, Ivy and the boy are in a park. He’s so pleased to find someone he can touch without harming her, he won’t let go of Ivy’s hand. Moments later, the kid collapses in a sweat. Agents appear, and after a brief struggle, take both the boy and Ivy into custody. Soon they are on a plane, where the agents conclude the boy’s own toxicity was killing him, as his toxic defense system had gone into overdrive trying to kill Ivy. The agents declare they are willing to let the boy die so they can recover and examine his body and toxins, and they want to keep Ivy to study her immune system. Moments later, Batman appears. He had been disguised as an agent, and he won’t let these men harm the boy. He quickly takes down the agents, but the boy is knocked from the plane and is falling. Batman frees Ivy so she can take control of the plane, and Batman jumps after the boy. Finally, Batman catches up to Ivy in Acachiano. The boy’s encounter with Ivy ultimately cured him, and Batman returned him to his family. 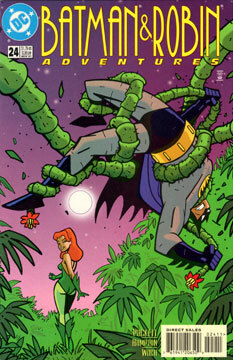 Then Batman arrests Ivy and takes her back to Gotham. This story is a diamond in the rough. I genuinely enjoyed it. We get to see Ivy’s humanity, as she tries to save the boy. Ultimately, the story is hurt by the short format. I could easily see this being expanded into a full, animated episode, or even a longer, more “serious” comic book tale. Not so good. Hampton and Woch’s work is fairly loose. The energy of the Timm style is lost.